Treat yourself or someone you love to the everlasting gift of radiant Diamonds. 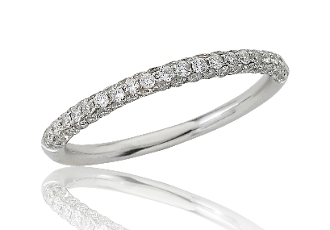 With feminine appeal from all angles this ring shimmers and shines with 64 brilliant round cut Pave Diamonds set across the top and each side of the highly polished 14 Karat white gold band. With a total carat weight of 0.47, this ring may be worn alone for a classic statement, or stack alongside other bands for a true fashion-forward look. For added appeal personalize your item, select our Engrave option and indicate size needed when adding to Cart.